Today, the latest Feh Channel presentation for Fire Emblem Heroes was stealth-released, out the blue. It details the various Events prepared for the 2nd Anniversary of the game, which happens to be…. today! First, starting today and until February 13th, there will be returning Summoning Focus events daily. They’re all from past Bound Hero Battles, and will only be available for 24h (of course, you still get one free Summon for each one). Make sure to check out the Events and Content Updates and Characters pages for details about each one! Next, a Special Hero Summoning Event will take place from February 2nd to February 9th. It will feature exclusive Special Heroes, and you will be guaranteed one 5 ★ unit. In fact, there will be two such Summoning Events, the second one running from February 9th to February 16th, and featuring Special Heroes added in 2018 and later (with the exception of Hot Spring Hostilies Heroes). Then, from February 4th to February 9th, a special minigame website will go live: the Find & Vote Heroes. The goal is for you to find your Heroes on a map, Where’s Waldo-style, and tap them in order to vote for them (can be done once per day). After that, if you find Alfonse, Sharena and Anna within 180s, your votes count double! The top Hero in each colour (the ones with most votes) will be part of a special Summoning Event at a later date. Update: website is now live. Click here to check it out! That 2nd Anniversary Hero Summoning Event will be a bit special. Instead of the regular coloured ones, this Summoning Focus will feature Golden Summoning Stones, each corresponding to one of the 4 colour types. When you select a Summoning Stone, you get the #1 Hero corresponding to a given colour as 5 ★ unit. After that first Summon, the #1 Hero will be available as Focus Hero for the other Summoning Stones. This 2nd Anniversary Hero Summoning Event will run from February 24th to March 4th. 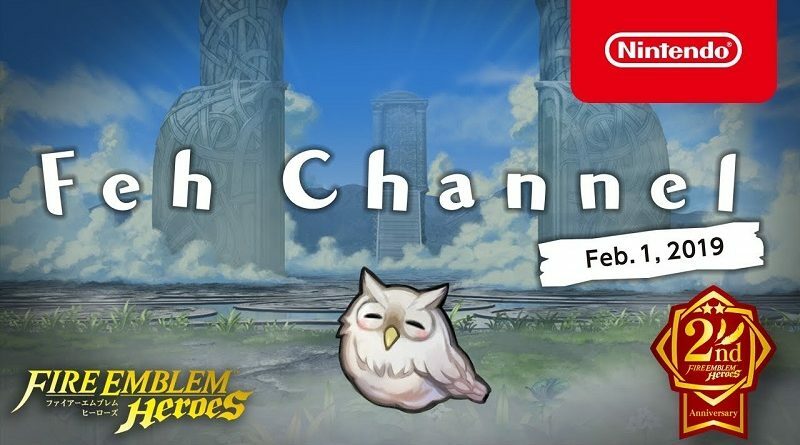 This new Feh Channel presentation also shared details about the next Software update for the game: Ver. 3.2.0. It will finally add a brand new background for your castle… the same one shown in the presentation! The update will also add a brand new type of item: Dragonflowers. They allow you to increase a Hero’s stats, though only a certain amount of time (5 times for all Heroes, except Infantry Heroes released up until now, who can go up to 10 times). There’s 4 types of flowers, one for each unit type: Infantry, Cavalry, Flying, and Armoured. By the way, the increased stats have no effect on arena matchups… try keeping that in mind when playing that mode! There will be several ways to get Dragonflowers, and one of them is a brand new type of map called Heroic Ordeal. Basically, it’s a special type of map prepared specifically for a given Hero, and as you can expect, you do need that Hero in your team in order to tackle the map. And it’s not just that: one of the victory conditions is that the focus Hero also defeats at least 2 enemies! Also, the highest AR tier will be bumped to 27, though ranks 22 to 27 will be reset to 21 at the beginning of a new season. By the way, Dragonflowers will be one of the new rewards available in Aether Raids! The presentation also went over the updates coming to the Merge Allies feature: check out this post for more details about that. Finally, to celebrate the 2nd Anniversary of Fire Emblem Heroes, various artists have prepared special illustrations: you can check them out on the official website!